If you are a regular reader, you probably already know how much we at Rocklin Ranch Veterinary Hospital care about dental care for pets. So many animals are affected by dental disease, and addressing it can make a hugely positive impact on the well-being and happiness of our patients. Many of our clients want to know exactly what we are looking at when we assess a pet’s oral health. Join us in learning a little more about the stages of pet dental disease so that you can do your part to keep your pet’s mouth healthy. No dental blog would be complete without reiterating the importance of dental care– dental disease in dogs and cats is all-too-common. It results from the buildup of plaque on the surfaces of the teeth over time. The bacteria that live in the plaque irritate the gingival tissue and eventually can lead to infection in the bone surrounding the tooth. The plaque may also mineralize over time into hard tartar, which promotes further plaque accumulation. 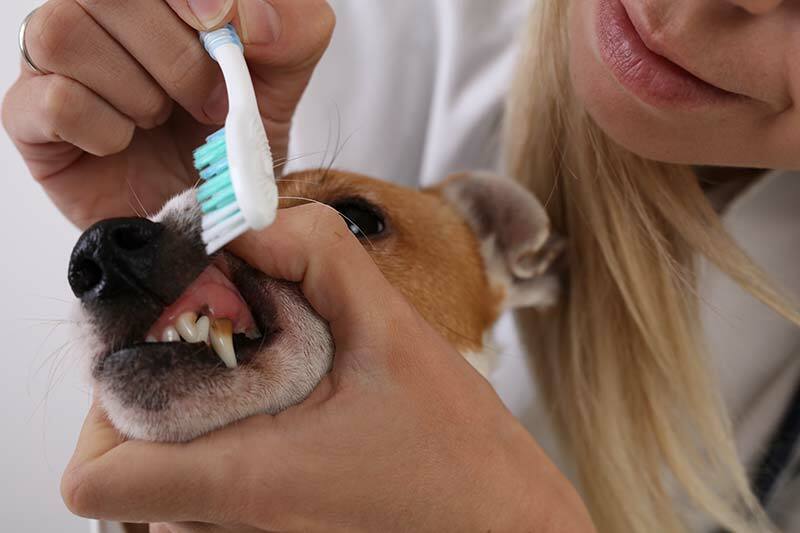 We know that pets receiving good dental care live on average two years longer than those who don’t. Something this impactful deserves a lot of attention. Stage 0 — In stage 0 dental disease, the teeth appear clean and the gums are flat and pink without any evidence of inflammation. On radiographs there is no evidence of any bone loss. During this stage home dental care is advisable. Stage 1 — Stage 1 dental disease describes a mild amount of plaque and tartar along the gum line as well as early signs of inflamed gums. No bone loss exists on x-ray. A professional cleaning is warranted as well as a good home care routine. Stage 2 — In stage 2 periodontal disease, there are worn teeth and/or mild to moderate swollen gums. On dental radiographs up to 24% of the bone surrounding the tooth may be lost. It is essential that a pet with stage 2 dental disease receive a professional dental cleaning in order to prevent further bone loss. Stage 3 — Stage 3 dental disease occurs when there is greater than 25% bone loss associated with a tooth, as diagnosed by dental x-ray. A pet in this stage of dental disease will need a professional cleaning as well as the extraction or advanced treatment (such as root canal) of the stage 3 teeth. Stage 4 — Stage 4 dental disease is very advanced, with greater than 50% bone loss. The risk for systemic infection and pain is very high. Pets with this degree of dental disease often need multiple tooth extractions. As you can see from the descriptions of the various stages of pet dental disease, a thorough oral exam is required to come up with the best plan. This involves full anesthesia and intraoral radiographs (x-rays). Our goal is to keep your pet happy, pain-free, and with as many teeth as possible. Accurately diagnosing the stages of pet dental disease is an integral part of accomplishing this goal. Give us a call today to see if your pet is due for an oral assessment so that we can help you get started.